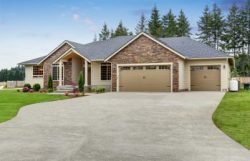 As you are discussing your driveway, foundation and masonry you’ll probably use the terms concrete or cement in your conversation. Most people actually use these two words as if they are synonymous, however they actually are two different materials and should not be used interchangeably. Here’s a quick guide for you as your consider what your items at your house are made of. Cement is actually an ingredient that is used in concrete. It makes up about 10 to 15 percent of concrete. Cement is a formed with lime and clay and it is a powdery substance. When cement is mixed with water is creates a mortar. When cement is mixed with sand, gravel and water it is made into concrete. Concrete is made when cement and water are mixed with aggregates, which are sand and rock. A typical concrete mixture is: 10 to 10 percent cement, 60 to 75 percent aggregates and 15 to 20 percent water. Correct aggregate usage for your concrete depends on the width and intention for use for your final product. Concrete usually gets stronger as it ages. It has the ability to be molded into whatever shape it’s poured into and it becomes a solid when it hardens. Anglin’s Foundation and Masonry Repair is Atlanta’s foundation repair experts. We repair settling or sinking foundations, leaning chimneys and cracks in your masonry. Contact us today; we’re a company with integrity and a name you can trust. All our work is backed by our price protection warranty and John Anglin’s personal guarantee. Call us today!